The BreedingGrey Gull Larus modestus is a medium-sized gull (length 18in (46cm)), approximately the same size as the Common GullLarus canus L. canus and the Ring-billed GullLarus delawarensis L. delawarensis. Its range extends along the west coast of South America from Colombia to Chile (maximum range during winter dispersal). It breeds in colonies on the inland deserts of northern Chile and Peru. It is best described as being of typical gull proportions with the adult having mainly grey plumage with a striking white head (which becomes brownish when the bird is in non-breeding plumage) and the primaries and secondaries being dark, almost black, with the wings having a white trailing edge which remains visible when the wings are closed. Adult plumage is acquired in the third winter. Young birds have overall brownish-grey plumage which, with each moult, becomes greyer on the body and the wings, and the head becomes progressively paler. 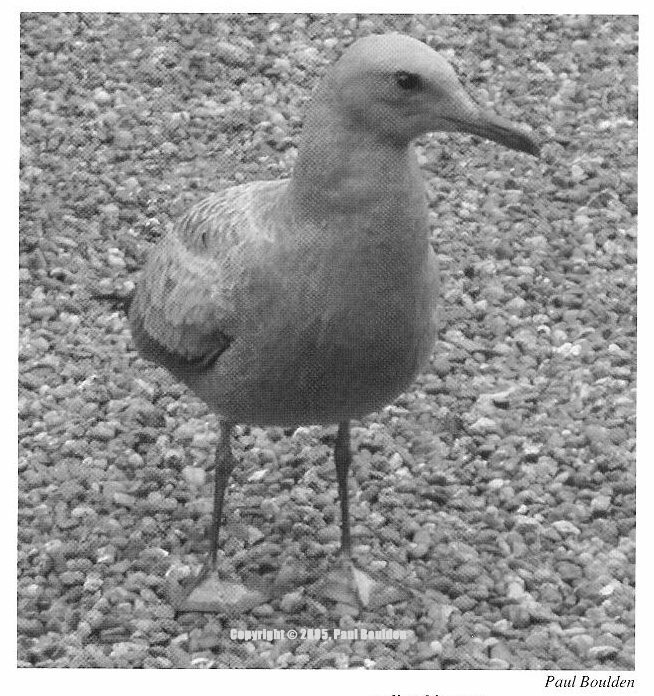 A pair of Grey Gulls arrived at Paignton Zoo Environmental Park on March 6th 2001. The pair came from Heidelberg Zoo, Germany, where the male was hatched in 1998 and the female in 1996. Ever since their arrival here they have been housed in the Cottage Aviary, a large planted aviary with a pond and shelter. The aviary measures approximately l2m x 15m x 3m high (roughly 40ft x 50ft x 10ft high) and has a substrate of gravel areas - and grass areas as well as a shallow concrete pond. The pair has bred consistently for the past four years and the gulls are being kept as a growing colony. Other current occupants of the aviary include: Red-billed Chough Pyrrhocorax pyrrhocorax, Northern Lapwing Vanellus vanellus, Black-necked Stilt Himantopus mexicanus, Madagascar Teal Anas bernieri, Chestnut Teal Anas castaneaA. castanea, White-faced Whistling Duck Dendrocygna viduata, Mandarin Duck Aix galericulata and Palawan Peacock Pheasant Polyplectron emphanum. The gulls have not interacted badly with any other species and are more likely to be chased off by other birds than to assert themselves. This quiet, almost docile, behaviour is hardly what is expected from a gull but their repeated breeding has demonstrated that they are healthy and contented. The breeding results from 2002-2005 have resulted in one chick being reared in June 2002, two in June 2003, two in June 2004 and one in July 2005. The nest is a simple scrape in the gravel in which a clutch of two eggs is laid. The nest has always been in roughly the same spot, an open area at the back of the aviary. Unfortunately the site is at the bottom of a small slope and therefore liable to flooding and it is thought that this may have caused the loss of one of the eggs earlier this year. In the wild the Grey Gull nests in large colonies up to 100km (approx. 60 miles) inland. There they lay one to three eggs, the lowest average clutch size of any gull. The nest is attended by one of the pair at a time whilst the other flies off to feed. Due to the considerable distances between the feeding areas and the nests the chicks are fed only once a day (mainly on fish). This may contribute to the slow growth rate of the young (the slowest rate of any gull) which do not move to the coast until they are at least 40 days old when they join the adults, feeding mainly on Mole Crabs Eremita analoga but also finding food along the strandline and scavenging behind fishing boats. The global population numbers about 100,000 pairs and they are not considered threatened although large scale egg collecting may be a problem. They are also vulnerable to the effects of El Niño and do not breed in years when the conditions are too severe. At the zoo their main diet consists of Sprats Clupea sprattus but they also have access to a variety of other foods provided for the other species sharing the aviary. During the breeding season mealworms are also provided for some of the other aviary occupants. As far as I am aware the Grey Gull has not previously been bred in captivity in the UK. Hoyo, J., Elliot, A., Sagatal, J. (eds.) 1996. Handbook of the Birds of the World, Vol.3 Hoatzin to Auks. Lynx Edicions. Barcelona, Spain. As described above, the Grey Gull Larus modestus, has been bred at Paignton Zoo Environmental Park. This is thought to be the first breeding of this species in Great Britain or Ireland. Anyone who knows of a previous breeding is asked to inform the Hon. Secretary.